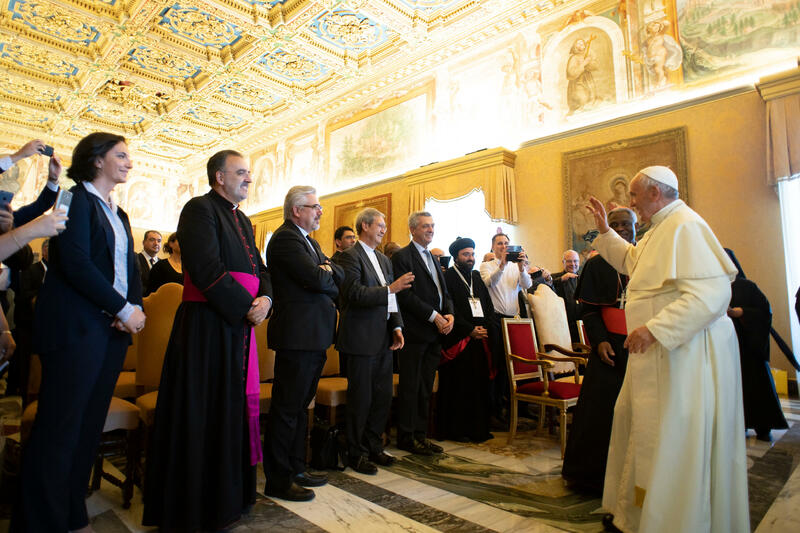 The Holy Father’s comments came in the Consistory Hall of the Vatican Apostolic Palace, where he received the participants in the Fourth coordination meeting of the Catholic charitable organizations working in Iraq, Syria and neighboring countries, organized by the Dicastery for Promoting Integral Human Development, in particular in the Migrants and Refugees Section, in collaboration with the Secretariat of State and the Congregation for the Oriental Churches, underway from 13 to 14 September at the Pontifical Urban University. I greet all of you warmly and thank you for taking part in this sixth meeting for coordinating the Church’s response to the crisis in Iraq, Syria and neighboring countries, a meeting which this year includes also the Section for Migrants and Refugees. I thank particularly Cardinal Peter Turkson and the Dicastery for Promoting Integral Human Development who have organized this meeting, in conjunction with the Secretariat of State and the Congregation for the Oriental Churches. I am grateful also to Mr. Filippo Grandi, United Nations High Commissioner for Refugees, for his presence and his work helping refugees. Many thanks! For too many years the conflicts of bloodshed in that region, and the situation of peoples in Syria, Iraq and neighboring countries, have continued to cause great concern. Every day, in prayer, I bring before the Lord the suffering and needs of the Churches and the peoples of these beloved lands, as too the needs of those seeking to provide help. And this is true: every day. With this third study regarding humanitarian aid provided by ecclesial groups, you are offering an important contribution to better understand the needs of these populations and to coordinate aid to them. As I have recalled on several occasions, there is the real risk that the Christian presence may disappear in the very land from which the light of the Gospel first emanated. In cooperation with the Sister Churches, the Church is working to diligently ensure a future for these Christian communities. The whole Church looks to these brothers and sisters in the faith and encourages them through closeness in prayer and concrete charity not to give in to the darkness of violence and to keep alive the light of hope. The witness of love with which the Church listens and responds to the cry for help from all, starting with the weakest and poorest, is a source of light in the present and a seed of hope that will bear fruit in the future. This particularly fine Christian project reminds me of some passages from the prayer attributed to Saint Francis of Assisi: “Where there is hatred, let me bring love… Where there is despair, let me bring hope. Where there is sadness, let me bring joy”. Among the many praiseworthy initiatives you promote, it is important this year to mention the great project of supporting the return of Christian communities to the Nineveh Plain in Iraq, in a special way through the Open Hospitals project. Dear brothers and sisters, by God’s grace, let us look together to the future. I encourage you, who work in the name of the Church, to continue to provide for the education of children, employment for young people, closeness to the elderly and those who are psychologically wounded; without forgetting the wounds of the heart, which the Church is called to heal: “Where there is offense, let me bring pardon. Where there is discord, let me bring harmony”. Finally, and forcefully, I ask the international community not to neglect the many needs of the victims of this crisis, and above all to set aside special interests in order to be at the service of peace, and to bring an end to war. We cannot close our eyes to the reasons that have forced millions of people to leave – painfully – their home countries. At the same time, I encourage all parties involved, and the international community, to renew their commitment to ensuring the safe return of displaced persons to their homes. Ensuring their protection and their future is a demand imposed by civilized behavior. It will be through drying the tears of children who have seen nothing but ruins, death and destruction that the world will recover its dignity (cf. Address at the Conclusion of the Dialogue, Bari, 7 July 2018). In this regard, I reiterate my appreciation for the great efforts undertaken on behalf of refugees by various countries of the region and by a variety of organizations, among whom are those represented here. Let us make the Prayer our own: “Lord, make me an instrument of your peace […]. Where there is darkness, let me bring light”. Being instruments of peace and light: this is what I wish for each of you. From the depths of my heart: thank you for everything you are doing each day, together with so many other men and women of goodwill. Thank you, thank you! May the Lord bless you and may Our Lady accompany you.